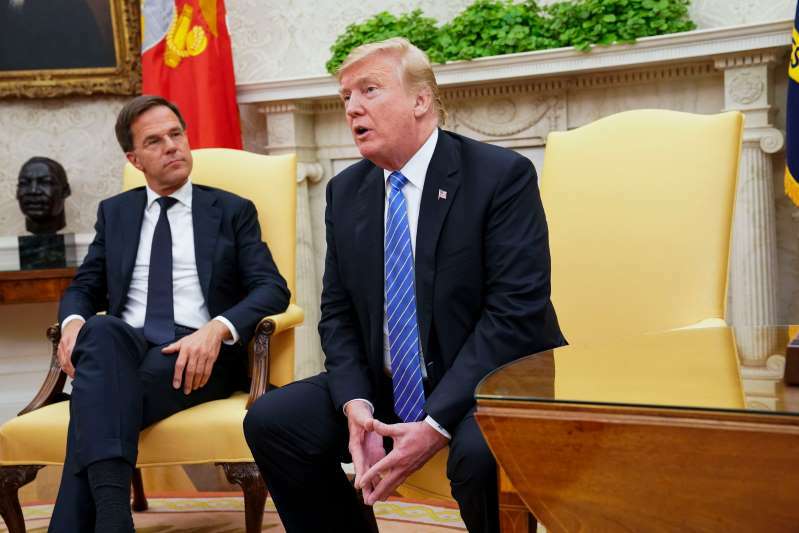 President Trump met with Denmark’s prime minister, Mark Rutte, in the Oval Office on Monday. In letters sent last month, Mr. Trump demanded that NATO allies spend more on their own defense. President Trump has written sharply worded letters to the leaders of several NATO allies, including Germany, Belgium, Norway and Canada, taking them to task for spending too little on their own defense and warning that the United States is losing patience with what he said is their failure to meet security obligations shared by the alliance. [post_ads]The letters, which went out last month, are the latest sign of acrimony between Mr. Trump and American allies as he heads to a NATO summit meeting next week in Brussels that will be a closely watched test of the president’s commitment to the trans-Atlantic alliance after he has repeatedly questioned its value and claimed that its members are taking advantage of the United States. Mr. Trump’s criticism raised the prospect of a second confrontation between the president and the United States’ allies after a blowup by Mr. Trump at the Group of 7 gathering last month in Quebec, and increased concerns that far from projecting solidarity in the face of threats from Russia, the meeting will highlight divisions within the alliance. Such a result could play into the hands of President Vladimir V. Putin of Russia, who is to meet with Mr. Trump in Helsinki after the NATO meeting, and whose primary goal is sowing divisions within NATO. In his letters, the president hinted that after more than a year of public and private complaints that allies have not done enough to share the burden of collective defense, he may be considering a response, including adjusting the United States military presence around the world. Mr. Michel reacted tartly to the letter last week, telling reporters at a European Union summit meeting in Brussels that he was “not very impressed” by it, according to a report by Deutsche Welle. Mr. Trump has long complained about NATO and routinely grouses that the United States is treated shabbily by multilateral organizations of which it is a member, be it the World Trade Organization or the North Atlantic alliance. But in Europe, the letters to NATO allies have been greeted with some degree of alarm because of their suggestion that Mr. Trump is prepared to impose consequences on the allies — as he has done in an escalating tariff fight with European trading partners — if they do not do what he is asking. Mr. Trump’s disparagement of Europe and NATO has become almost routine, leaving some veteran diplomats aghast. Last week, Jim Melville, the United States ambassador to Estonia, told friends and colleagues that he would resign at the end of this month after more than 30 years in the Foreign Service, in part because of the president’s language. “For the President to say the E.U. was ‘set up to take advantage of the United States, to attack our piggy bank,’ or that ‘NATO is as bad as NAFTA’ is not only factually wrong, but proves to me that it’s time to go,” Mr. Melville wrote in a Facebook post. He was referring to remarks about Europe that the president made during a rally last week in Fargo, N.D., and comments about NATO that he is reported to have made privately during the Group of 7 gathering last month. Jim Mattis, the secretary of defense, wrote to Gavin Williamson, the British defense minister, last month saying he was “concerned” that the United Kingdom’s military strength was “at risk of erosion” if it did not increase spending, and warned that France could eclipse Britain as the United States’ “partner of choice” if it did not invest more. A Defense Department official confirmed the contents of Mr. Mattis’s letter, first reported by The Sun.